In 1997 Imbizo Shisanyama, more popularly known by loyal patrons as ‘Busy Corner’, was established on a street corner in Ivory Park with only a single pot, gas griller, display fridge, gas paraffin stove and two employees. 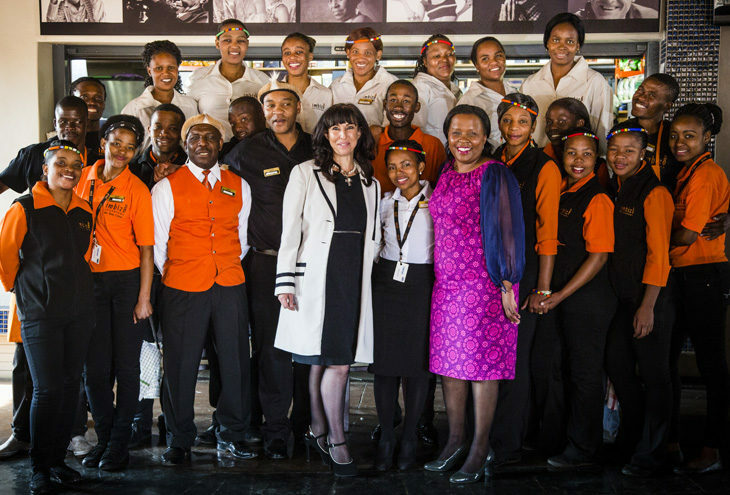 It was then that the concept of commercialised Shisanyama was born, and today it has become one of the fastest growth areas in the food, beverage and hospitality industry in South Africa. The explosion of this new sector also realised the successful commercialisation of the famous African dish iPapa. When asked why she chose to pursue this particular dream, Rita Zwane, founder of Imbizo Shisanyama, said she wanted to create a restaurant that would be authentically African and celebrate the great African identity, in an environment that exudes style, class and dignity. Her vision was to create a restaurant where patrons could celebrate everything about authentic African culture and lifestyle. The real experience at Imbizo Shisanyama has little to do with the stylish setting or expensive furniture. It is centred on family and friends celebrating important occasions and creating great, long-lasting memories by enjoying Africa’s Ultimate Braai Experience. After starting out with only two employees, Imbizo Shisanyama employs over 60 permanent staff members who receive provident fund and funeral cover benefits. Furthermore, with dedication and commitment the company strives to help uplift the surrounding community. This includes the involvement of the community in the everyday running of the business, such as car guards on weekends and Braai Masters, which help a further 20 families. The restaurant has also outsourced its security and cleaning requirements to local SME businesses and remains committed to developing and growing other small businesses within the community. The car wash, for instance, employs a further 14 young people. In total over 100 families are supported by the Imbizo Shisanyama business today. As with any successful business, there have been challenges, but it’s important to see a challenge in a positive rather than a negative light. Challenges offer entrepreneurs the ability to be creative, to learn and overcome. This is the true ingredient of success. One of the biggest challenges to the success and development of small business is the prohibitive costs of expansion and growth. Often new business ventures or ideas require a lump sum investment or a financial backer in order to cover costs such as deposits on lease agreements, land development, external project management fees, etc. These costs ultimately end up being the red tape that stifles many small business ideas and can be extremely demotivating when chasing your dream. Limited practical access to funding still remains the biggest threat to this sector in South Africa. Many organizations and financial institutions say on paper that they support the burgeoning SME sector but in reality we still have a long way to go before this gap narrows. When asked why we need to support small business, Zwane responded that small businesses are indeed the economy’s growth engine with the primary impact being felt firstly by their surrounding communities. At the heartbeat of SA’s GDP are small businesses which, when ignited, sustainably address the burning issue of unemployment. As these enterprises thrive, more opportunities are created in the more established businesses that form part of the entire value chain. Supporting and fostering a climate that promotes growth and development of SMEs is the single most critical component as the economic evolution of our country is in the hands of entrepreneurs. Imbizo Shisanyama won the title of the National Small Business Champion at the South African Small Business Awards 2013 brought to you by the National Small Business Chamber (NSBC).